Young Max loved power and strength like any little boy. It gave him inspiration. And so when a large contingent of his family and friends gathered at a Del Mar park Sunday to celebrate his short but full life, two biplanes plowed through the sky in a show of might that would make Max smile. Their engines roared and the crowd cheered and applauded for 7-year-old Max Mikulak who died recently after a 4-year battle with cancer. “He was just a really sweet, nice little boy,” said Max’s mother Melissa Mikulak, who wore his Indiana Jones ball cap that he received in June for his birthday. In 2004 Max was diagnosed with high-risk Stage 4 neuroblastoma, an aggressive pediatric cancer that is difficult to cure. For about a year after traditional treatment the disease disappeared, but it returned in 2006. The Mikulaks of Carmel Valley chronicled Max’s struggles and triumphs with his disease on an Internet blog read widely by family and friends and even strangers in other states. A video clip captured happier times of Max cheerfully singing “Ring of Fire” into a karaoke microphone. Then, sadly the couple posted this entry less than a week before he died on Aug. 31. Another post was a quote from Max’s sister Hannah. The wish, no doubt, of everyone who came to Seagrove Park and shared laughter and some tears as they remembered Max that day. Most importantly, Max’s parents wanted a celebration of Max’s life and his good and loving nature, maintained until the end despite his painful struggles. And how could one not? He was light and goodness and joy… an angel in our midst,” she said. His enthusiasm and smile were infectious, she said. All around the gathering there were symbols of Max and the things he loved. Many who attended wore orange, his favorite color. 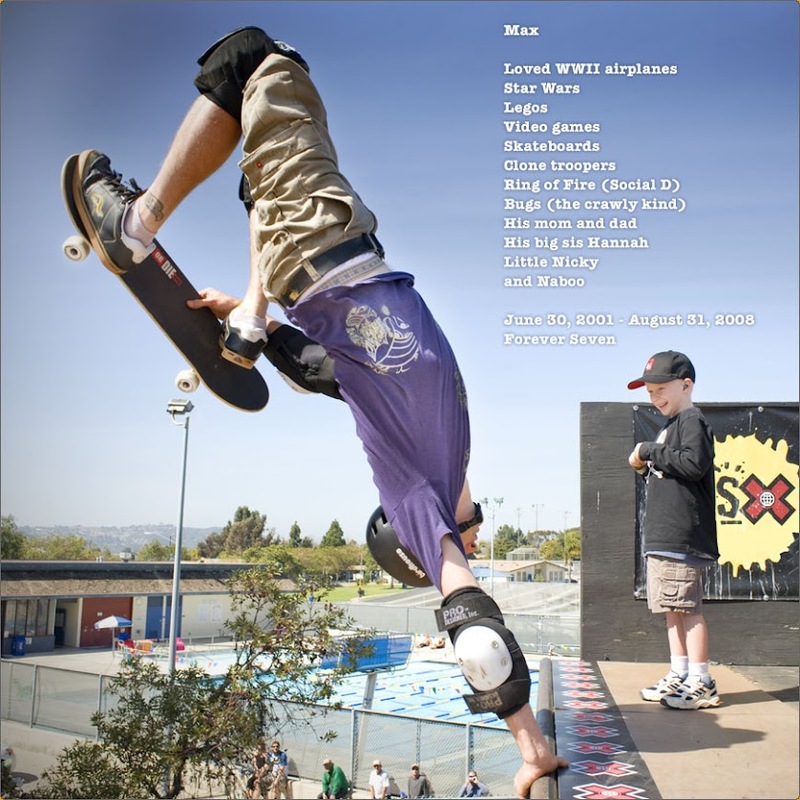 Others wore references to his favorite movies, “Star Wars and Indiana Jones.” A table held model airplanes, a toy train, treasure chest and dinosaur and photographs of a happy Max, including one with famous skater Tony Hawk in motion. In another display of might, a trained hawk flew over onlookers and then perched in a nearby tree. For a finale, the meat-eating bird flew to its trainer and snatched a morsel from his hand. Earlier, Max’s fellow cub scouts performed a mock aerial salute. Each hoisted a toy jet above his head and marched as if in a missing man formation traditionally flown in memory of a fallen pilot. Wanting to save his son and other children from cancer’s awful clutch, Andy Mikulak cofounded the MagicWater Project with Neil Hutchinson who also has a son with the same disease. It is a foundation dedicated to working with cancer researchers and oncologist to accelerate discoveries of potentially life-saving new drugs for children with relapsed neuroblastoma and medulloblastoma. The project funds clinical trials and other research on innovative, low toxicity treatments. The day after the celebration for Max, a few hundred people participated in a walk in Balboa Park to raise money for the MagicWater Project. Just over $18,000 was collected from the fundraiser, which was sponsored by RealAge.com, Andy Mikulak’s employer. More money is still coming in from the fundraiser and it will go toward the purchase of new imaging equipment at Rady Children’s Hospital that could provide quicker scans and results in the detection of cancer. Andy Mikulak said he will turn his attention to raising the additional money needed to buy the scanner for Children’s Hospital, he said. While the money raised from the walk is symbolically significant it is only about 10 percent of the roughly $1.5 million estimated cost. The Mikulaks plan to continue their efforts in the battle against childhood cancer and say they want their son to be remembered most of all for his loveable character. Although Max could behave like a typical boy there was never any meanness to him, recalled his father. Throughout his struggles Max was always happiest when everyone around him was happy. For Melissa, Max had a purpose that she wants others to remember: To live life to the fullest “because time is precious” she said. Then she repeated the words of encouragement so familiarly linked to their good-natured son, “We really did encourage him to live life to the max,” she said. What a great article & what a wonderful tribute to your amazing little boy! All 5 of you have been such an inspiration to all of us. I am constantly going to remind myself to "live life to the Max." I so enjoyed the article about Max and his Celebration last Saturday. What a difference he continues to make in our lives. I can't tell you how many people have asked about Max and how you are doing. Continued prayers and love. All week I have continued to be in awe at what a special day Saturday was...a day to honor our superhero Max. Max will forever and always have a special place in my heart. Thinking of you all! Great article - it is nice to read a story that is uplifting and a story so necessary to tell. It shows how much thought and love and consideration of Max's true personality went into planning this. You are amazing parents. I thought this was a beautiful way to highlight what a strong and inspiring person Max was & the wonderful parents that you are. Thinking of you often.